In Photo: (L-R) Jennifer Fajardo, Executive Assistant-Philippine Wine Merchants; River Joseph, Son of Honorary Consul General Robert Lim Joseph Jr., Chairman of Philippine WineMerchantsand The Wine Museums- 2nd and 3rd from left respectively, and Gina Lopez-Chairman of ABS-CBN Lingkod Kapamilya Foundation, Inc. during the turn-over of donation. 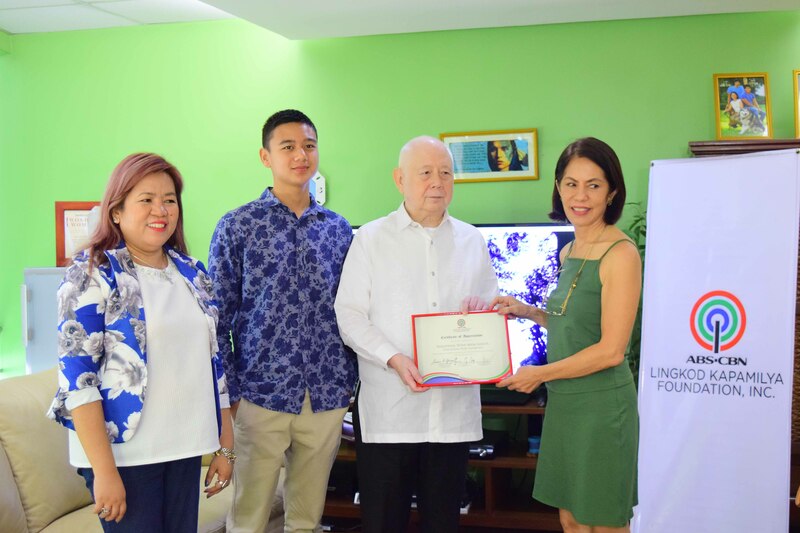 The Philippine Wine Merchants recently turned-over a monetary fund to ABS-CBN Lingkod Kapamilya Foundation, Inc. Came from a philanthropic family, Robert Lim Joseph, Chairman of the PWM personally donates to support the child-care advocacy of Bantay Bata 163. This act of generosity is the continuation of his late Mother’s legacy who used to be an unsung benefactor of Bantay Bata 163.